A warm day in late June found groups of students being led around a village of two lines of 15 tiny homes on either side. Seven years ago, Quixote Village was a moving camp for people experiencing homelessness, hosted for 90-day stretches by volunteering churches in the community. 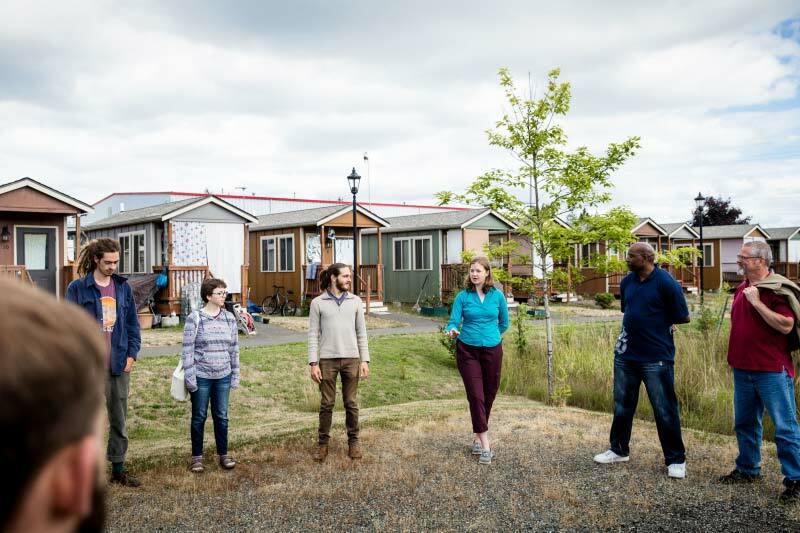 The 5 week summer class at Evergreen, Tiny Homes, Earthships, and other Innovative Buildings: Design Principles for Low-impact Homes, taught by faculty member Scott Morgan, was looking at how that camp became tiny houses, and how those tiny houses became homes. Jaycie Osterberg, program manager of Quixote Village and two-time graduate of Evergreen in years 2011 and MPA 2015, began the tour of the village with an introduction to the communal space. Thirty residents share one building that holds a kitchen, seating area, and showers, since the houses are too small for their own. She soon handed the presentation over to others, including current Evergreen students Aaron Sauerhoff and Melissa Rasmussen. Sauerhoff holds a facilitating position in the summer class due to his own knowledge of alternative living and intern involvement with Quixote Village. After the class split off into smaller groups to tour other areas of the residence, Jill Severn, a volunteer for Quixote Village, led a small number of visitors to the garden. She admitted that the garden itself is more volunteer-led, but made sure to expound upon other accomplishments the residents had made mostly on their own. One example? Effective self-governance. Teaching the class, Scott Morgan’s rules were a little different. “For the most part, I’m looking at these basic systems and functions that we need from a house. From a home.” He said that houses and homes don’t have to be the same thing, since people find home in their vans, earthships, cob houses, and other alternative living structures. “The trick here is figuring out what you need out of your house, then looking at what inspires you, and then bringing in everything else,” Morgan asserted. It was a long struggle to get Quixote Village approved and running due to the sheer size of the project. However, professor Morgan’s vision for the students starts at a smaller scale: themselves. In addition to visiting Quixote Village, students of the class had opportunities to take part in tiny home and cob house workshops across the Olympia community. They also toured a company that deals with high-efficiency building materials, and watched presentations about the tiny house movement. 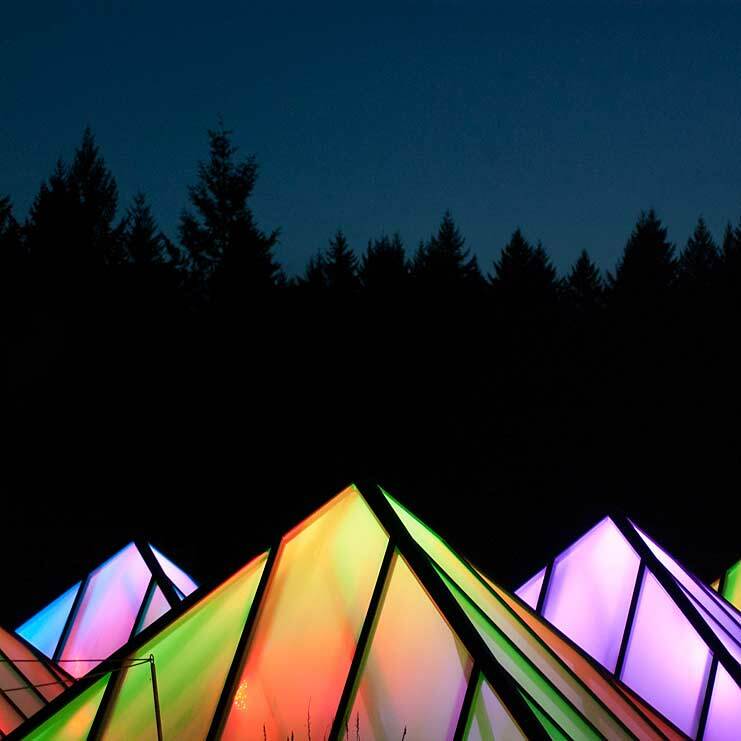 In the future, Morgan hopes to collaborate with other faculty to offer a more in-depth program that includes information about the infrastructure and lifestyles of alternative living.